Thinking of buying Yaro Starak’s Blog Mastermind 2.0? Make sure to read this first. You’ll kick yourself later if you don’t. Full review and more than $500 in bonuses below. So…the big question…what’s up with Yaro Starak’s course, Blog Mastermind 2.0? I hope this review answers any questions you have. So, now that we’ve got all of that out of the way, here’s my full review of Blog Mastermind 2.0 by Yaro Starak. What’s Good About Blog Mastermind 2.0? So this is key in pretty much any course or product I promote. I want to know that the person I’m recommending (because I’m recommending Yaro Starak as much as I’m recommending Blog Mastermind 2.0…) has actually done what they’re teaching. It’s literally a deal-breaker for me. Yaro has. It was after earning over $10,000 A MONTH from his blog that Yaro put together and sold the original Blog Mastermind. I don’t know about you, but six figures a year from blogging tells me that he definitely has a few things that he could teach you and I about how to grow our blogs! 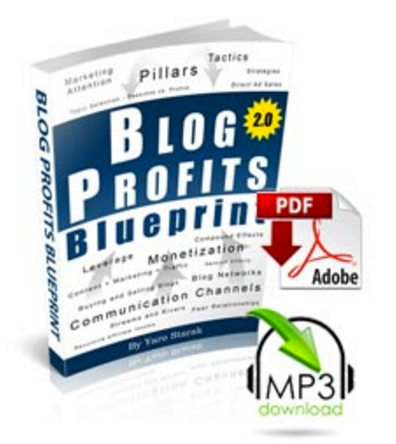 Have you read Yaro’s Blog Profits Blueprint?? Umm yeah, it’s awesome! And he gives it away for free. If there’s one thing I’ve learned is that when someone is willing to give away content that is better than most people’s paid products, you can bet that their paid products and courses will be unbelievable. Blog Mastermind 2.0 is no exception to this! Yaro lays out 88 pages of amazing content on how to run a profitable blog…and it’s just the appetizer to the information and support available in Blog Mastermind 2.0! If you have any doubt about how awesome Blog Mastermind 2.0 will be, just start reading Blog Profits Blueprint and I guarantee that you’ll be convinced that Yaro’s course will be nothing short of top notch! Some people can do but can’t teach. Yaro Starak can do both! He ran the first version of Blog Mastermind from 2007-2010 and had over 2,000 students go through the course. As they say, “The proof’s in the puddin’ “. This isn’t a brand new course that is untested and unproven. Yaro has proven the techniques he’s teaching through his own blog AND through the blogs of countless others who have taken his course and implemented what he teaches. Yaro has helped dozens of people (maybe hundreds…) earn 5 figures a month through blogging. In other words, he has helped these people create six figure businesses through Blog Mastermind. You may have asked yourself by now why Yaro calls this Blog Mastermind 2.0 and not just Blog Mastermind. Well, let me tell you why. You see, Yaro originally released his program in 2007…and it went gangbusters! Like I said above, over 2,000 people went through the course–with phenomenal success! But Yaro told me that around 2010 he started to realize that the info in the course was beginning to be a bit outdated. So he shut it down. That’s because there are things more important that making a bunch of money to Yaro Starak. He is determined to provide top quality content! So he shut down the program until he could completely rework the program to make sure it was up to date with the latest techniques and systems to create a profitable blog in today’s online environment. Well, he finished it this year…and it’s all new and definitely worthy of the “2.0” designation. To be honest with you, it’s really not even the same course! Blog Mastermind 2.0 has unbelievable content…and Yaro has made sure that you can consume the content just about any way that you like! What do I mean by that? The course is available on video…but there is also full PDF Transcripts and MP3 files for each module as well. Well, it means that Yaro totally understand that you are extremely busy…so you can take the content with you when you’re commuting to work…or the gym…or your in-laws house for the holidays. Bottom line is you can consume the content literally any way you want. Those aren’t the bonuses I’m talking about here. Yaro is offering some unbelievable bonuses of his own as well. Yes. Yaro is giving you access to the entire Blog Mastermind 1.0 just for purchasing Blog Mastermind 2.0! Blog Money Finder — This training will help you discover the best topic for your blog PLUS includes Yaro’s unique “Blog Money Test” which will help you test whether or not your topic will generate paying customers. Power Podcasting — Yaro has been using a podcast to grow his blog audience for over a decade. In this special training he will teach you everything from the tech side of starting a podcast, getting great guests..and most importantly, how to leverage your podcast to grow and monetize your blog! Coaching with Yaro — Yaro is offering everyone who signs up 4 live training webinars that you can take part in to learn directly from Yaro and ask questions about what you need more help on. Even without these bonuses, Blog Mastermind 2.0 is a killer deal…with this bonuses (and my bonuses below…) it’s a no-brainer! What’s Not Good About Blog Mastermind 2.0? I believe Yaro Starak’s course is the absolute best course out there for learning to grow and monetize your blog…but even then, I wouldn’t be honest if I didn’t share the downsides that I see with the course (though there really aren’t too many…). Let me be clear. I have no doubt that this course is going to be unbelievable. However, I haven’t actually been through the course…so I can’t tell you every single little detail about the course. That being said, I am more than willing to recommend the course because of Yaro’s success, reputation and the awesome free content that he provides! Yaro recommends that you work on 1 module of Blog Mastermind 2.0 a day for 6 weeks. That is quite the commitment, and might be too much for some people. If you aren’t willing to invest time into going through the course and following through on Yaro’s recommendations, this course will be a waste of time and money for you. Be sure that you are willing to invest the time to go through the course before you sign up. That is really the only downsides I could find with this course…yes, I believe it is going to be THAT good! Who is Blog Mastermind 2.0 For (and Who is it not For)? Blog Mastermind 2.0 is designed to help anyone that wants to use their knowledge and expertise to create either a part of full-time income. This is also for bloggers and online publishers who already have a blog but are looking for a system that will take their blog to the next level. Blog Mastermind 2.0 is NOT for someone who is looking to have a blog simply as a hobby. If you’re wanting to blog solely for a hobby, you will certainly learn from this course…but it is not tailored to the hobby blogger, but rather for the person looking to monetize their blog and create an income stream from their blogging. It is also not for someone who is looking for a “get rich quick” scheme…there is REAL effort involved in implementing Yaro’s system. That’s a pretty awesome promise. You will either have your blog up and running in 2 weeks or…well, you’ll have your blog up and running–courtesy of Yaro–for free! Beyond that, Blog Mastermind 2.0 has a 60 day money back guarantee… yes, that is TWICE as long as most people off on their courses! That’s a very generous guarantee. Ok, now onto the exclusive bonuses I mentioned earlier on. If you purchase Blog Mastermind 2.0 by Yaro Starak through my affiliate link you will get 2 exclusive bonuses…and the best part: even if you decide that Blog Mastermind 2.0 is not for you, you still get to keep these bonuses. Together, they are valued at $598. Creating, marketing, growing and monetizing a blog can feel almost impossible, especially without the right mindset. That’s why I’ll give you the Limiting Beliefs Self-Coaching Guide. There are four types of limiting beliefs that you will need to overcome and I teach you how to do so in this self-coaching plan. Until this year, this workbook was only available to my private coaching clients, but I know how critical it is to conquer your limiting beliefs to do something awesome (and daunting) as building a successful and profitable blog! If you go through my affiliate link for Blog Mastermind 2.0, you will also get a free ticket to my next Networking with Purpose Live event. Getting your blog in front of a large amount of potential readers and customers requires the right connections. That’s why I’m GIVING you access to the next Networking with Purpose Live event. This live online event will show you how to build, grow, and nurture your network to help you grow your awesome blog! So really, the only question left is, What are you waiting for? Click here to purchase Yaro Starak’s Blog Mastermind 2.0 and get ready to build an amazing and profitable blog!